Tae Yang ~ LOVE !!! Dong Young-Bae (Korean: 동영배, Hanja: 董永培, born May 18, 1988), better known by his stage name Taeyang or SOL, is the main vocalist in Big Bang. Like the other members, Taeyang is signed with management company YG Entertainment. He began training under YG Entertainment at the age of twelve alongside fellow member and leader G-Dragon. After six years of vocal and dance training he made his debut in 2006 as part of Big Bang. 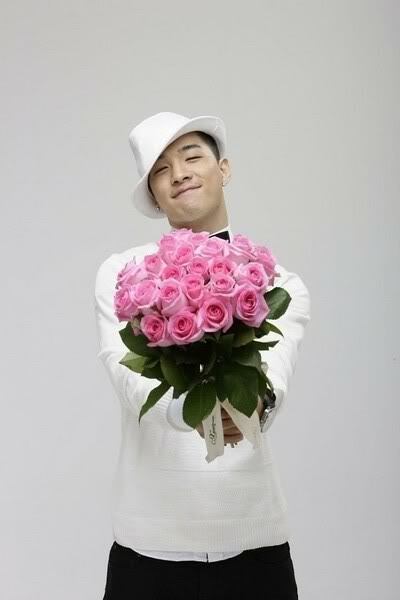 Taeyang was a child actor at the age of 11, acting in JinuSean’s A-Yo music video. After that, he auditioned to join YG Family. In 2003, he participated in Wheesung’s second album, rapping on the track "Player". He performed with JinuSean, Swi.T, Lexy, Se7en, Masta Wu and YG Family, and took part in Wheesung, Gummy, Se7en and YG Family's One concerts. Young Bae was scheduled to debut with G-Dragon, under the group "GDYB" however the group didn't debut. Later, Taeyang debuted with Big Bang, releasing popular songs such as "거짓말 (Lies)" and "하루하루 (Day by Day)". Tae Yang released his first solo album on May 22, 2008, entitled Hot which yielded the lead single "나만 바라봐" ("Only Look at Me") followed by "Prayer" which featured Teddy of 1TYM. The album was produced by Teddy, Yang Hyun Suk, and Kush, with Tae Yang co-producing the album. [nb 1] The album sold over 50,000 copies. Later that year, he performed his first solo concert, "Hot". Throughout the majority of 2009, Tae Yang contributed to his band's activities through South Korea. After activities ended for the group, Tae Yang returned to his solo activities. He released his first digital single "Where U At", followed by another digital single, "Wedding Dress", on November 13, 2009. The latter manage to peak at number three on the Dutch Music Chart. Tae Yang's second official album is set to be released in early 2010. In late December, it was announced Taeyang would collaborate with Japanese artist, Thelma Aoyama for her single, "Fall in Love", which will be released on January 27, 2010.
wow.. cool.. kainggit may js sila. Subject: Re: Tae Yang ~ LOVE !! !